If you are considering to start your career in nursing, one of the easiest ways to get started is to become a Licensed Practical Nurse (LPN) or Licensed Vocational Nurse (LVN). Becoming an LPN/LVN requires you to take an accredited educational program that is approximately one year in length. Note that both LPNs and LVNs work under the direction of either RNs or physicians. Most states in the US refer to these workers as LPNs, but in California and Texas, they are referred to as LVNs. LPNs and LVNs can be limited to doing certain jobs depending upon which state they are in. In some states, LPNs are able to give medication and start IVs; they may not be allowed to do these duties in other states. Many LPNs and LVNs work in their field for one or two years, and then eventually earn their bachelor’s degree to become a full-fledged RN. This is a good option if you would like to explore the career first to see if it is a good fit, before committing to a full four year degree program. If you are thinking about becoming an LPN or LVN, you probably are curious about what the difference is between that role and that of an RN. Becoming an RN or registered nurse requires you to obtain your bachelor of science in nursing, or BSN, which is a four year degree. As mentioned above, becoming an LPN/LVN takes one year of training, plus the required clinical hours. Read more about LPN vs RN roles and differences. Administering basic nursing care, such as changing bed pans, changing bandages, inserting catheters and IVs. Keep patients comfortable; helping them to get dressed, eat and to bathe. Talk about health care issues and concerns with patients and families. Update doctors and nurses about patient status. Keep careful records on health of patients. Record the medical histories and symptoms of patients. Give treatments and medications to patients under the supervision of a physician. Establish plans of care for patients, and recommend changes to existing plans. Observe the condition of patients and record observations for physicians. Consult with physicians and other health care workers about patient status. Monitor medical devices that are used on patients. Do diagnostic tests and provide results analysis. Educate the patient about how to manage their illness or injury. Provide explanations to the patient about how to manage their health at home. An LPN or LVN must complete an educational program and have a license, just as an RN does. The educational requirements are less however. The LPN/LVN program takes about one year to complete. Some of the classes that an LPN/LVN student will take includes nursing, biology, chemistry, pharmacology, and the appropriate number of supervised clinical hours. After earning your certificate as an LPN/LVN , you then may sit to take the NCLEX-PN examination. To practice as an LPN/LVN in all US states, you must pass this exam. RNs must earn a Bachelor of Science in Nursing, which is a four year degree. Some nurses first earn an associate’s degree in nursing, or obtain a diploma from an approved nursing program. This allows them to gain practical nursing experience, and then they can earn their four year degree. In a BSN program, the RN student will take classes in nursing, anatomy, physiology, chemistry, microbiology, psychology, nutrition, sociology and also liberal arts classes. Some of these latter classes will include coursework in leadership, critical thinking and communication. You also will have supervised clinical hours in a hospital to complete your degree requirements. After you graduate from your BSN program, you are eligible to take the NCLEX-RN examination. Both LPNs and LVNs can earn certifications through various professional associations in gerontology, IV therapy and many others. Earning a certification as an LPN/LVN indicates that you have a higher level of knowledge about a subject, which can lead to higher earnings. All LPNs and LVNs must have a license for the state in which they work. After you complete your LPN or LVN education, you are eligible to sit for your licensing examination. To obtain your license, your state will require you to prove that you have graduated from an accredited LPN or LVN program. It also may require you to pass a background check. You may have to provide fingerprints, too. Each state in the US administers the National Council of State Boards of Nursing (NCLEX-PN) examination. This is the exam you must pass to get your license. See 6 things you should know about the NCLEX exam. You will need to renew that license every few years, and your employer likely will require you to provide documented proof of your active license. Each state will have different processes for licensing LVNs and LPNs. For example, the state of California has separate licensure application processes depending upon if you graduated from a LVN school in CA, a school from another state, or have education and experience equivalent to an LPN education. 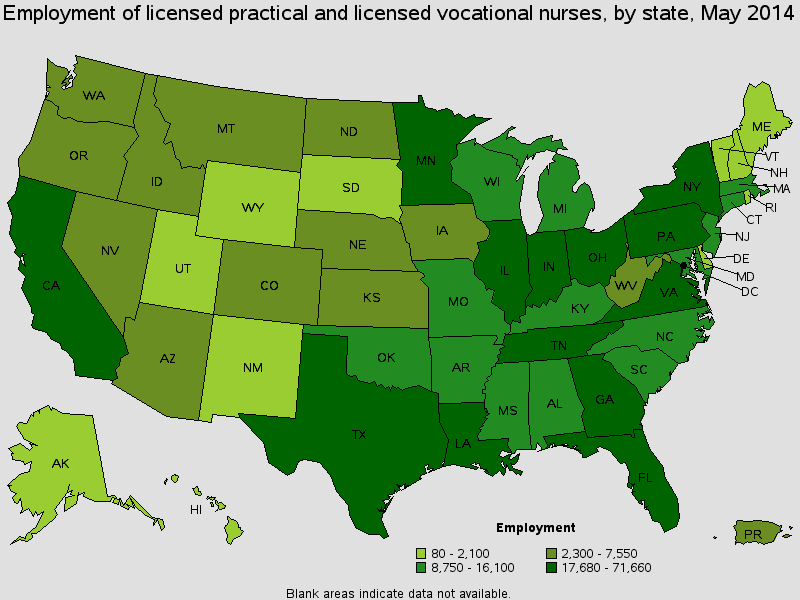 NOTE: 24 states currently are part of the Nurse Licensure Compact (NLC) that allows the nurse that has one multistate license to practice in their home state and in the other compact states. NLC states can be found on this page on the NCSBN website. Legally reside in one of the NLC states. Hold an active LPN or LVN or RN license that is in good standing. Declare an NLC state as your primary residence state. Meet all licensure requirements of your home state. The Department of Labor reports that the median salary for this profession is $41,500, with the top 10% earning more than $57,000 per year. To compare, the median salary for all registered nurses is approximately $65,000 per year. (2) Annual wages have been calculated by multiplying the hourly mean wage by 2080 hours. Where Do LPN/LVNs and RNs Work? The majority of LVNs work in a nursing care facility, home health care organization, community care center, a doctor’s office, or hospital. Some LVNs also work in outpatient centers, dialysis clinics and blood banks. Meanwhile, about 50% of all RNs work in medical or surgical hospitals. The other RNs usually work in doctors’ offices, nursing care centers and home health care services. Job demand for LVNs and LPNs is soaring, with a 25% growth rate expected by 2022, which is much faster than other professions. The surge in demand is similar for RNs.